We brought our water table inside one day when the weather was WAY too cold to go outside. There have been a lot of people affected by cold temps this winter and big winter storms have been making this winter feel verrrry long! And cold...really cold! So when it's too cold to go outside, and the kids are going bonkers inside...what do you do? You can only play with the same toys so many times when you've been stuck inside for so many snow days. 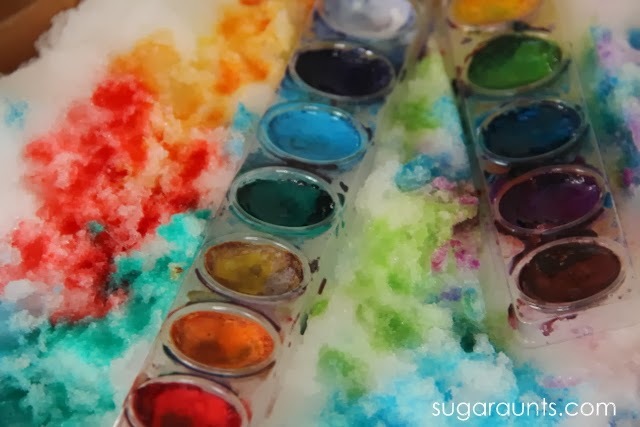 This Watercolor Snow Painting activity was just the thing we needed to get creative and have some winter fun! 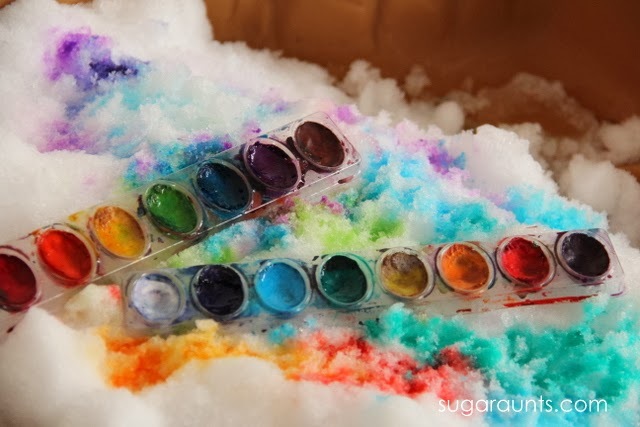 We've done both indoor snow painting and outdoor snow painting before and both were very fun. This watercolor version was just as much fun in a different way! We started by pulling our water table in from the garage and a few bins of snow were all we needed to fill it. A few paint brushes and some watercolors and we were all set. This was so much fun. The snow lasted in the house for a couple of hours and as it melted on the edges, we had more water for painting. When Big Sister came home, we brought in a few more bins of snow so she could paint too. This started a whole new round of painting fun. The colors were so bright and pretty on the snow. AND we were toasty warm! 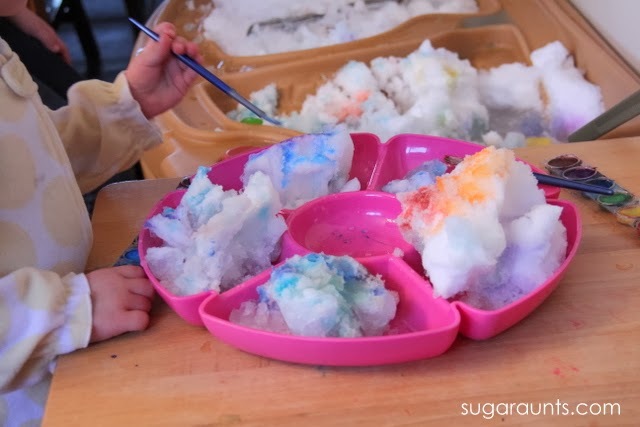 A few kitchen utensils were brought in for some scooping and serving "snow cones". 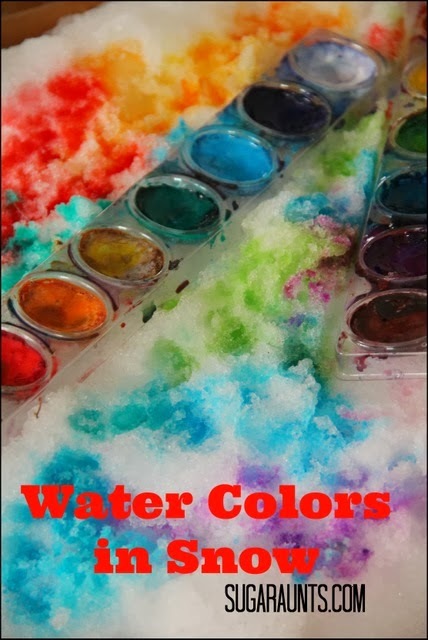 What a fun sensory experience! Our friend Jaime over at Frogs and Snails and Puppy Dog Tails did some snow painting too. You have to check out what they did when they got some snow. Very fun stuff! 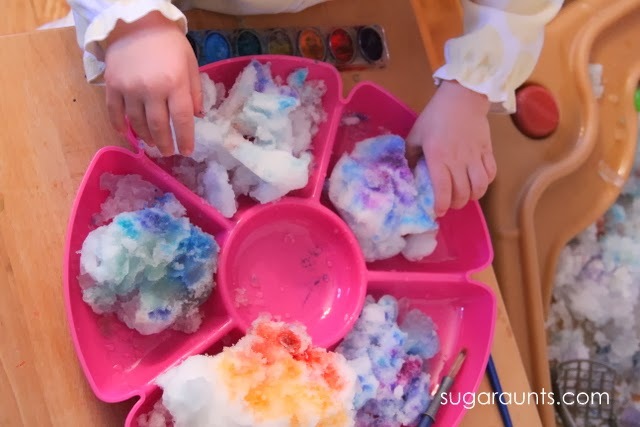 Follow Sugar Aunts's board Winter Fun and Play on Pinterest.